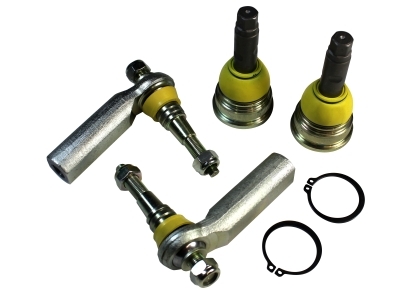 Whiteline roll center and bump steer correction kits are designed to correct roll-centre geometry using specially engineered ball-joints and tie rod ends. The KCA306 kit has 3 adjustment settings to provide precision geometry tuning to the varying heights of lowered Mustangs. Raising the front roll-centre results in a substantial increase to front roll resistance and a significant reduction in suspension compression of the outside front wheel during cornering. The result is more even weight distribution and improved tyre contact ultimately improving front end grip and cornering speeds.